The Skinny: Uncompromising and utterly excellent cop thriller from Milkyway Film. by Kozo: The guys at Milkyway go the “Cop Soap Opera” route with predictably top-notch results. Director Patrick Yau’s third film is an allegorical thriller about the little surprises life holds. 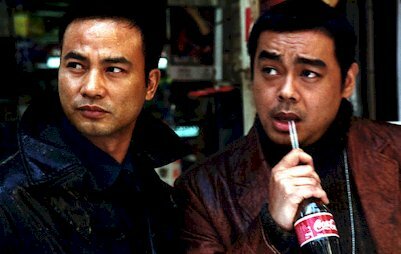 The film's allegory exists with the juxtaposition between some Mainland Chinese thieves, some Hong Kong thieves, and our a varied group of cops. Somewhere in there is a message - and a damn pessimistic one - about post-1997 Hong Kong. Yau's focus is a stereotypical group of cops from the “O” department. Ken (Simon Yam) is the leader, a by-the-book cop who’s seemingly beyond reproach. Sam (Lau Ching-Wan) is the mischievous, irreverent cop. Macy (Ruby Wong) is the female in the group, who has an apparent crush on Ken. They’re called into action when a jewelry store robbery seemingly ends in a bloody shoot-out. In reality, the cops are chasing two groups of thieves - one an amazingly inept mainland bunch and the others an inhuman HK killing squad. Meanwhile, Sam and Ken find themselves rivals over the affections of lovely witness Mandy (Yoyo Mung). The filmmakers set up each and every cliché carefully - then they spend the rest of the movie tearing those same conventions apart. The title holds true - sometimes distressingly. The plot shifts as new information is brought to light and situations veer in unforeseen directions. Some events in the film destroy all expectations - and leave the viewer possibly angry. This rigid approach affects the film both positively and negatively. Thematically all the pins drop cleanly, but the film doesn’t reach its denouement with the proper sense of closure. That’s a tough quibble, because this isn’t a film about closure or happy endings. It’s precisely about how those things rarely happen. Things are not what they seem, life is fragile, and an instant can hold dire consequences.